Things are pretty quiet here this weekend, we’ve started some of the smaller projects for remodeling our bedroom (those of you that follow me on Facebook and Twitter have been getting little sneak peeks!) and tonight we are going to my husband’s work party at another one of our favorite restaurants! As things start to settle back down after the holidays I figured this would be a perfect time to revisit some projects that fell by the way-side last year. Way back when I made these insulated casserole dish carriers, I started looking in to glass etching. 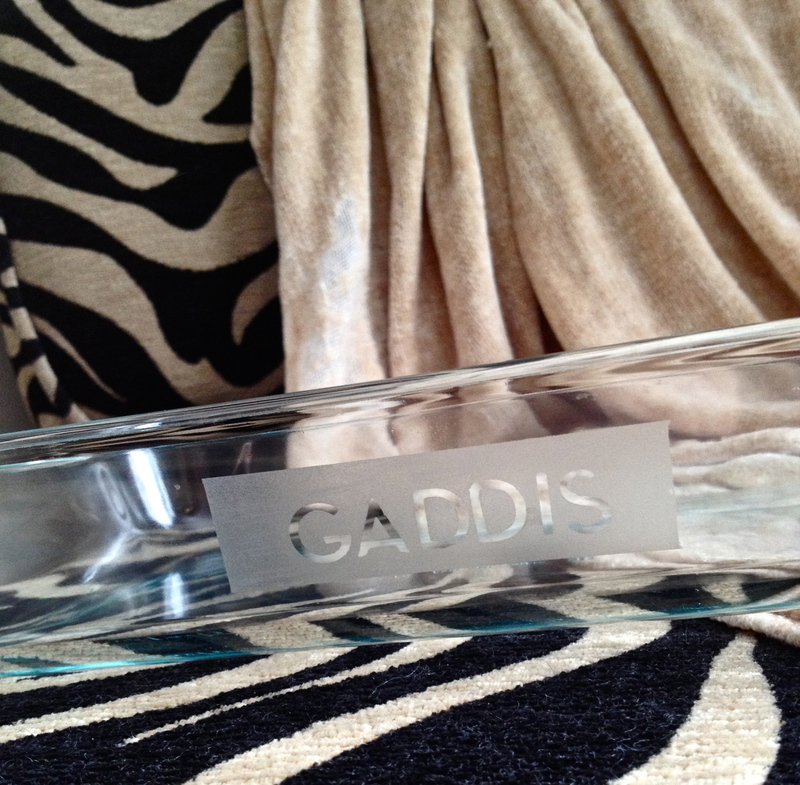 I thought it would be a cool way to personalized dishes and ensure that you would always get them back! I also thought it would make for a great wedding gift, pyrex dishes with the couple’s last name etched into them and a nice carrier for transporting them. 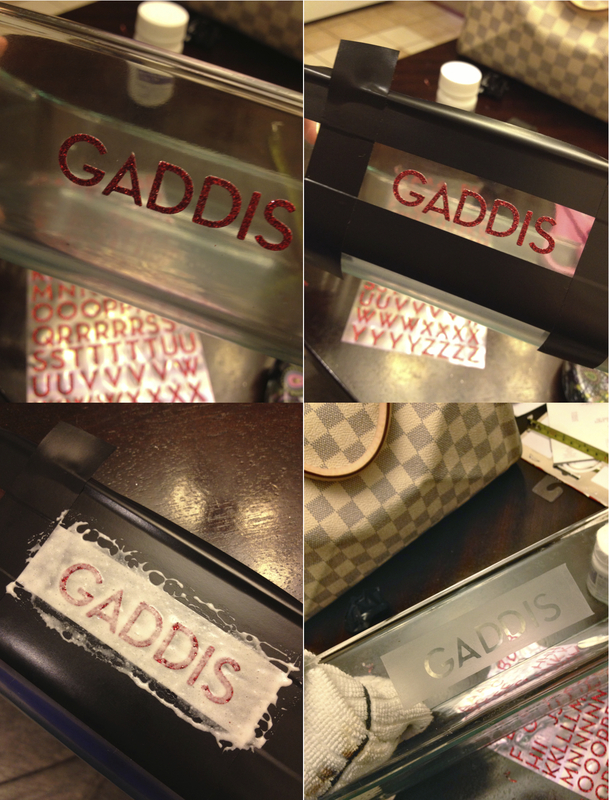 The idea of it was simple, cut a stencil out of vinyl and use the glass etching cream to etch the name out. I went out and got all of the supplies only to realized that it you don’t have a Cricut or similar machine it’s next to impossible to cut out letters with holes in them (i.e. O’s, B’s, A,s, etc) so I gave up on it. A few nights ago I was playing around and figured out a MUCH simpler way to do it that only requires some letter stickers, tape and the glass etching cream. The coolest part is that you use this technique to personalize anything that’s glass… pyrex dishes, vases, drinking glasses, trays, etc. Start off by decided what you want to etch on. I etched all of our Pyrex dishes but as I mentioned before you can choose anything that has a glass surface. Take letter stickers in your desired size (nothing special here, I used some scrap booking stickers I had laying around) and place them where you want them on your item. Next, use tape to map out a shape around your letters (I used electrical tape because that’s what I had closest to me). The idea is that where the letter stickers are will not will etched and the border you make around it will be. I decided on a super simple rectangle, but you do any shape you can create from tape. Next, use a paint brush to paint a thick layer of glass etching cream – I used Armour Etch which I got at Michaels. The label says to leave it on for 60-90 seconds but the first time I tried it, it didn’t etch. I started leaving it on for about 10 minutes just to make sure it worked and that yielded much better results. Once it’s sat for long enough rinse it with warm water and wipe clean. Take the tape and the stickers off, wash the whole dish in warm soapy water and voila! You now have a personalized item that is perfect for your home or as a gift. That’s so easy! And so cute! Thanks for the idea!!! And, Happy New Year! Thanks! It’s so easy and I love the idea of personalizing things in a really simple way! I’m glad you posted this because I’ve had all the ingredients for “etching” in my craft closet for a couple of years but never got around to doing it. Thanks for giving me the incentive to begin! I hope you do try it… I was the same way I had all the stuff but never did it, I’m glad I finally decided to! Very cool. Is it dishwasher safe? I might give it a try! Yes the cream eats away at the glass so once it’s done it’s perfectly safe to put in the dishwasher!